Bay leaf is a member of the lauraceae family also called the Laurel family, from an evergreen tree with dense foliage, the leaves of which are dark green with a shiny finish on the top and more of a dull matte finish underneath the leaf. The tree produces purple berries that should never be used in cooking because they are poisonous; the flowers are small and waxy, and cream colored with yellow stamens. The tree is native to ancient Asia Minor and cultivated largely in the Mediterranean. The botanical name Laurus nobilis comes from the Latin laurus meaning laurel and nobilis meaning noble. 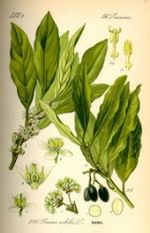 The noble laurel reached Britain in medieval times and was treasured by the Romans. This tree was also featured prominently in Greek mythology. Distinguished poets were given the name poet laureates and scholars and physicians given the term baccalaureate due to being given laurel berries in recognition of their achievements. Today the majority of these leaves are produced in Turkey. When purchasing these leaves they should be a dark green, the darker the better. When they are properly stored they will remain fresh and potent for up to three years. Powdered leaves are not used very often it is the whole leaf that is used because the ground version loses its potency after only 12 months. These leaves are used when slow cooked recipes are being prepared and are discarded after cooking is completed. They are thus great in soups, stews, casseroles and other dishes.